A USD alumna and senior secretary at the law school, Christina Schroeder, completed a 70-day biking journey across the United States this summer to raise awareness about young adults who have cancer. The ride was with with 4K for Cancer, a program of the non-profit Ulman Cancer Fund for Young Adults that aims to help young adults unite to help fight for other young adults who have cancer. The program has four cycling teams that go across the country and two teams that run. The process of getting into the program, Schroeder said, included doing research on the program, applying for the program, getting interviewed and then waiting to see if the participant is accepted or not. After getting accepted in June 2015, Schroeder began training. 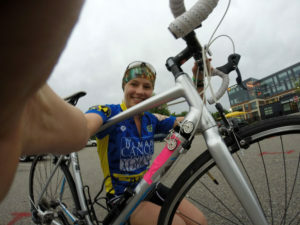 Schroeder said she had no previous biking experience before deciding to take on the journey, and borrowed a friend’s bike before raising $1,500 in fundraising money for her own in December. 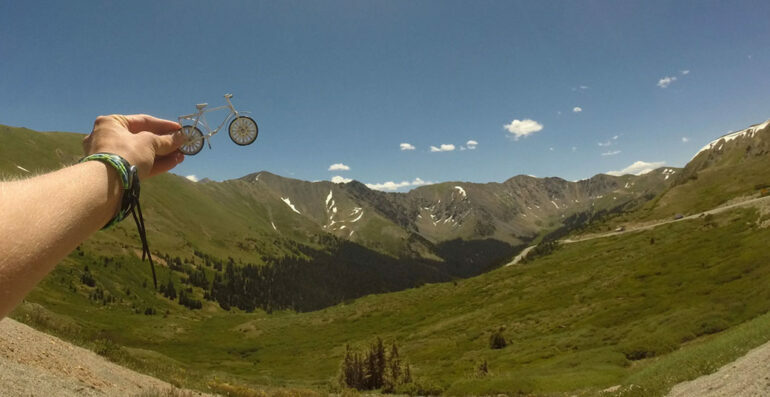 Schroeder had trained for about a year before the actual biking trip. Before leaving for the bike trip, Schroeder had logged around 2,000 miles during her training period. The main reason Schroeder said she participated was because she believes in the cause, and she had to learn a lot about biking before going into the trip. Schroeder said that the bike trip was enjoyable, though there were times she felt were “definitely difficult.” Overall, the experience was good because of her duty to help with cancer awareness. Besides going on the bike trip, Schroeder has worked to raise awareness and funds for cancer in other ways – she founded the “Shavetober” event at USD, and shaved her head one year for the event. Skylar Marcoux, the program coordinator for 4K for Cancer, worked with Schroeder during the summer, and said since Schroeder has had other experiences working for cancer awareness and because she feels strongly for the cause, she worked hard. The purpose of the bike trip was to show support for cancer patients who are undergoing cancer treatments, and to simulate what they go through. “For something so extreme like that, it is very life-changing,” Schroeder said. “Being able to relate to chemo treatments without going through it really brings a whole new perspective to the things that cancer patients go through,” she said. Schroeder said the challenges they faced weren’t the same as cancer patients, but still allowed the bicyclists to have a window into what some patients go through. “So, imagine a cancer patient who is sore and tired and does not want to go to the hospital to get treatment; learning that is a perspective that I think we will remember forever… you hear stories that can just blow your mind and this person is still fighting on. They’re the reason why we continue for the day of riding,” she said. During the trip, Schroeder rode 3,854 miles out of 4,000, and with her team of 22 people, they road more than 4,500 miles in total. Schroeder said during the trip, the team switched roles of who were in the two vans — the “water van” marked the route with chalk so the cyclists knew where to go and providing rest stops, and the “host van” that was in charge of taking duffle bags and backpacks and finding food donations for the team. During the trip, Schroeder was in one of the vans 10 days out of 70. The team also required 10 rest days, so the members each logged in around 50 days total for riding. There was one day, Schroeder said, the team chose not to ride out of respect for Anne Davis, a member on a different biking team who was hit and killed by a vehicle during the bike trip. Each morning, Schroeder and the team would gather in a dedication circle to dedicate their day of riding for a cancer patient, so they would have an inspiration for that day. Schroeder also kept up with a blog, onesmallbike, and brought along a tiny bike trinket that she took photos of on her journey. Marcoux said Schroeder did a “great job”at being the leg leader of the team.